It’s one thing to get schooled by a younger sibling in a video game, but how about by an animal – specifically, a cat? You vs. Cat is the first multiplayer iPad video game made for cats. That’s what human gamers are experiencing, as the aptly titled You vs. Cat made its debut at the South-by-Southwest (SXSW) Conference in Austin, TX. 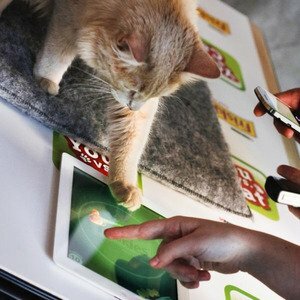 The video game, made by Friskies, runs on the iPad, and the object is to score a goal which is guarded by a live cat. A human flicks an animated object toward the goal and the cat must bat it away before it crosses the line by touching the object on the touch screen. Sounds simple enough, but one player, Buddy the Cat, is schooling a long line of human challengers, and is currently undefeated. On the global leaderboard, cats are beating humans by a more than two-to-one margin. Don’t believe it? Give it try yourself, as the game will be available for free download next week. You vs. Catis the first multiplayer cat video game for the iPad, but the cat-food maker has previously released several single-player offerings for the tablet, including Cat Fishing 2, Jitter Bug, and Party Mix-Up! For more information, visit Friskies website.